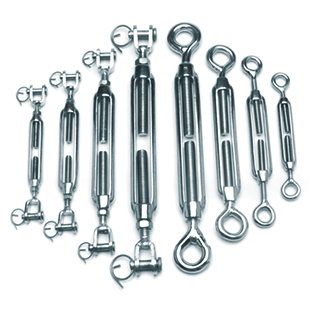 Turnbuckles supply tension by adjusting the length for supporting rope, wire rope, and chain. At its most basic, a turnbuckle is a couple of threaded eye bolts linked to its torso. However, the end fittings can also be a jaw or hook, depending on the specific need of the turnbuckle. The instruments at each end (i.e. eye, jaw, hook) are adjustable and thread into the body frame.